Download "FOOTHILLS NURSING CONSORTIUM General Information"
1 2/20/2012 Generic 2013 ADN FOOTHILLS NURSING CONSORTIUM General Information 1. The Foothills Nursing Consortium includes: Cleveland Community College, Shelby Isothermal Community College, Spindale and McDowell Technical Community College, Marion 2. The Foothills Nursing Consortium (FNC), Associate Degree Nursing (ADN) program is approved by the N.C. Community College System Office and the N.C. Board of Nursing. 3. 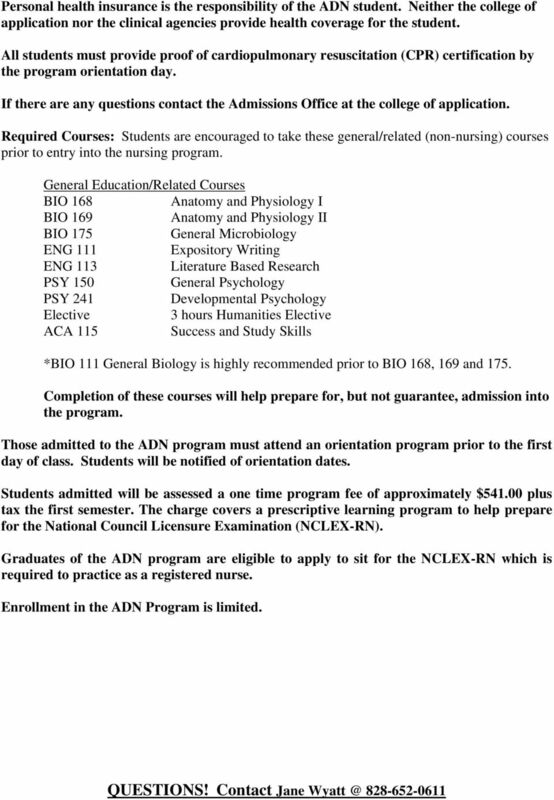 Characteristics of the ADN program: a) will prepare students to apply to sit for the National Council Licensure Examination (NCLEX-RN) which is required to practice as a registered nurse. b) is designed for five sequential semesters in length. c) will be separate from the existing practical nurse programs in the above colleges. 4. Isothermal Community College is the administrative unit and the central location of the three colleges. 5. The commuting time to the administrative unit from the other two colleges is approximately thirty minutes or twenty miles. This means the greatest distance between the consortium colleges is approximately one hour or 50 miles. 6. Nursing classes will be held on all three campuses at some period of time during the program. 7. When possible, non-nursing courses will be scheduled on the campus of the student's county of residence. 8. Application must be made to the student's home college within or closest to the service area. An out of county applicant may apply to his/her school of convenience. 9. When possible, clinical experiences will be scheduled in or near the student's county of residence. 10. Current listing on the North Carolina Nursing Assistant I Registry, without findings against the listing, is required for entry into the ADN program. 11. Upon admission to a program with a clinical component, a criminal background check and/or drug testing will be required by the clinical site prior to participation in the clinical component. Students should be aware that their graduation progress will be limited by an inability to complete the clinical portion of the program at any clinical site. The cost of any background check will be the responsibility of the student. 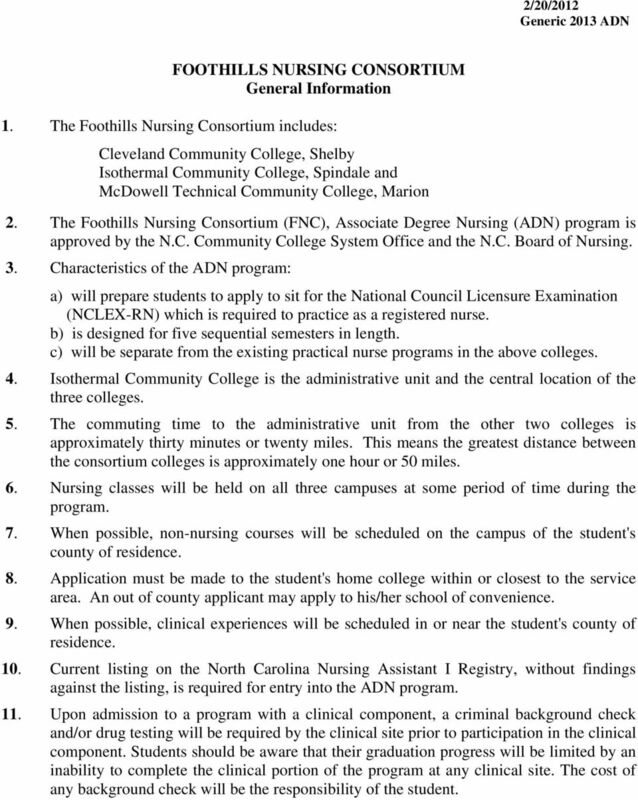 2 The Foothills Nursing Consortium includes: Associate Degree in Nursing (ADN) Program Applicant Information Packet FALL 2013 Cleveland Community College 137 South Post Road Shelby, NC (704) Isothermal Community College Post Office Box 804 Spindale, NC (828) , Ext. 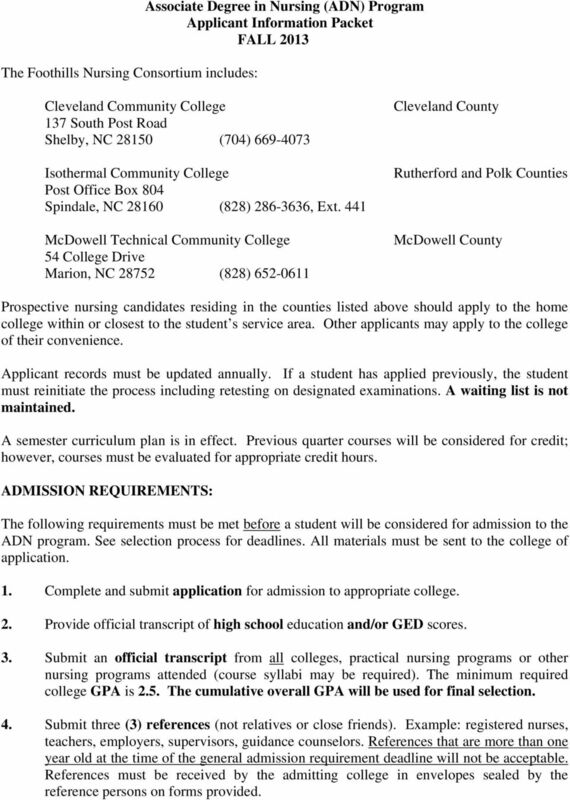 441 McDowell Technical Community College 54 College Drive Marion, NC (828) Cleveland County Rutherford and Polk Counties McDowell County Prospective nursing candidates residing in the counties listed above should apply to the home college within or closest to the student s service area. Other applicants may apply to the college of their convenience. Applicant records must be updated annually. If a student has applied previously, the student must reinitiate the process including retesting on designated examinations. A waiting list is not maintained. A semester curriculum plan is in effect. Previous quarter courses will be considered for credit; however, courses must be evaluated for appropriate credit hours. ADMISSION REQUIREMENTS: The following requirements must be met before a student will be considered for admission to the ADN program. See selection process for deadlines. All materials must be sent to the college of application. 1. Complete and submit application for admission to appropriate college. 2. Provide official transcript of high school education and/or GED scores. 3. Submit an official transcript from all colleges, practical nursing programs or other nursing programs attended (course syllabi may be required). The minimum required college GPA is 2.5. The cumulative overall GPA will be used for final selection. 4. Submit three (3) references (not relatives or close friends). Example: registered nurses, teachers, employers, supervisors, guidance counselors. References that are more than one year old at the time of the general admission requirement deadline will not be acceptable. References must be received by the admitting college in envelopes sealed by the reference persons on forms provided. 3 5. Placement tests will be administered by the college of application. It is the applicant s responsibility to contact the college s testing center and make arrangements for placement testing (828) The placement testing consists of Reading, English/Writing Skills, Numerical Skills and Algebra. 6. Complete all developmental courses required as a result of placement tests with a grade of "C" or better by the specified deadline. See examples below (lower scores may require additional lower level courses): Reading and Writing Foundations ENG 85/95 or ENG 090/090A Reading and Comp Strategies ENG 85/95 or RED 090 Pre-Algebra MAT 60 Algebra MAT Prerequisite courses: Students must either have (1) completed courses in high school biology and chemistry (complete high school unit) with a grade of B or above or (2) completed courses in *biology and **chemistry in college with a grade of C or above. Prerequisite courses are not accepted from the Adult High School Diploma Program unless the student is a graduate of the program. *Students who have completed college level Anatomy & Physiology with a grade of C or above will be exempt from the prerequisite biology course. 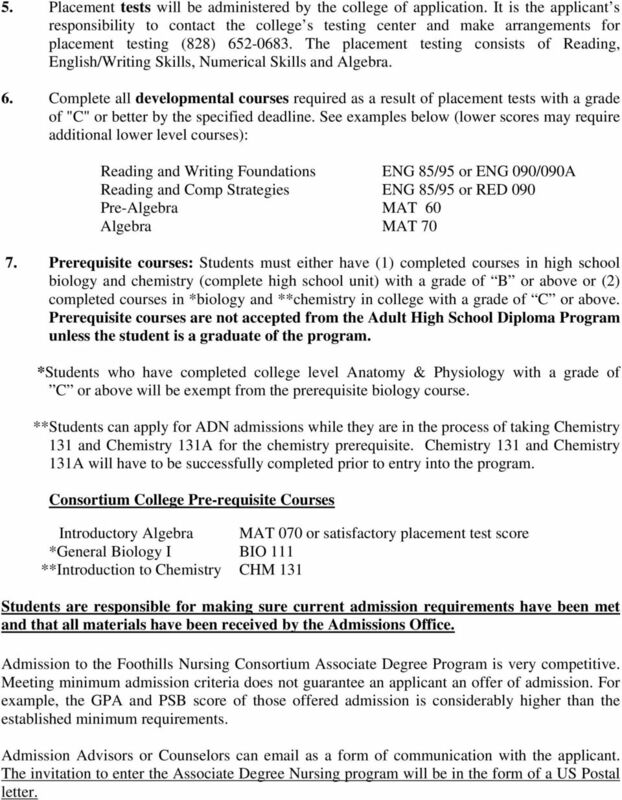 **Students can apply for ADN admissions while they are in the process of taking Chemistry 131 and Chemistry 131A for the chemistry prerequisite. Chemistry 131 and Chemistry 131A will have to be successfully completed prior to entry into the program. Consortium College Pre-requisite Courses Introductory Algebra MAT 070 or satisfactory placement test score *General Biology I BIO 111 **Introduction to Chemistry CHM 131 Students are responsible for making sure current admission requirements have been met and that all materials have been received by the Admissions Office. 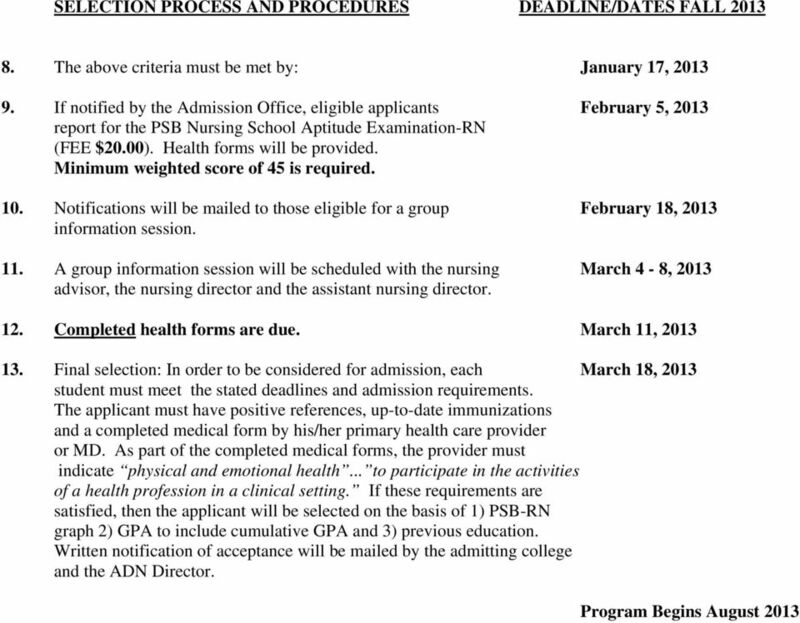 Admission to the Foothills Nursing Consortium Associate Degree Program is very competitive. Meeting minimum admission criteria does not guarantee an applicant an offer of admission. For example, the GPA and PSB score of those offered admission is considerably higher than the established minimum requirements. Admission Advisors or Counselors can as a form of communication with the applicant. The invitation to enter the Associate Degree Nursing program will be in the form of a US Postal letter.